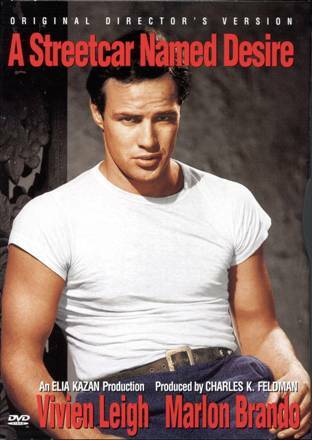 You are currently browsing the tag archive for the ‘Marlon Brando’ tag. While Jeff is doing finals, I usually rent lots of movies. After I put Lincoln down for bed, I usually get pretty bored without Jeff. This is of course when I decide to rent the classics, cause generally Jeff doesn’t like them as much. I decided to rent A Streetcar Named Desire. Mmmmmmmmm. It was a good movie. Interesting. I couldn’t help but be distracted by the thought of what people back in the fifties thought when they saw this movie. I mean….it disturbed me to a point, I wonder how my Grandma reacted. Anyways…I am a huge Vivien Leigh fan so I always wanted to see it. Marlon Brando is a great actor as well. So good in fact, that most of what I have seen him in makes me hate his character. He is that good. You can go HERE if you want to learn more about it, I won’t give away the story too much. It did surprise me, it wasn’t what I thought it would be. Needless to say, I now understand this Seinfeld episode a whole lot more now. I realize that a lot of you are probably way ahead of me on this.